Online surveys market is a crowded place. You can find tens of web sites offering online survey services. Some are good, some are mediocre. Some are fee, some are very expensive. But, if you study carefully, you will be able to create 2 (maybe 3) large categories of web sites in this market. First of all, you will find the popular survey websites like SurveyMonkey, Zoomerang, QuestionPro, eSurveysPro or SurveyGizmo. We have reviewed 3 of them so far, we will review the others in the next weeks. On these sites, you will find free accounts and you will also find the prices they charge for the premium accounts, prices that are in reasonable ranges. Besides the websites noted, there are also other that fall into the same category. We will try to identify them all and review in the near future. Besides these websites, you will find another type of survey sites – the enterprise feedback management systems. There sites situate themselves into a category targeted to privileged people: high end companies with very large budgets. 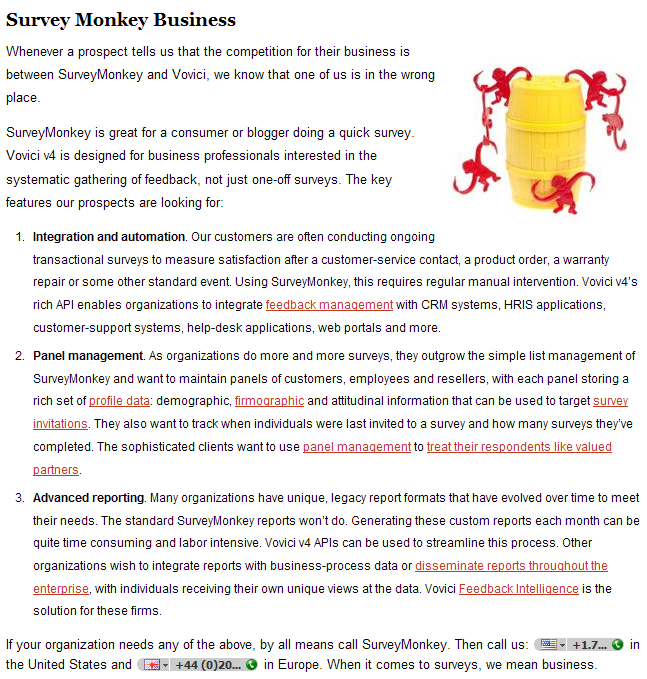 Here are a few examples: Vovici, KeySurvey, Qualtrics. 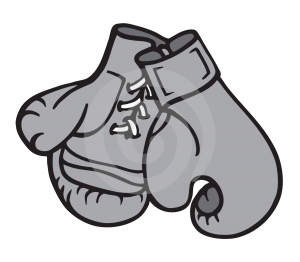 You will not be able to find a price list on these sites. You will not even be able to trial them easily. On these sites you will only find links like “Request a quote” or “Request a demo”. There are 3 posts written only a few weeks apart in March 2009. All 3 of them not only they praise to the roof their services, but mock a competing product. To me it seems childish. And those monkey images are not even funny (see screenshots below). I don’t know if SurveyMonkey replied in any way (there are not too active online on blogs, forums, etc), but it does not look like a professional way to advertise a product. I wonder what was the reason of these posts. Customers hit by crisis searching for more affordable survey services? It might be it, since Vovici recently advertized the price for their “first public offering”: Vovici Individual Edition. $99/month which is still 5 times the price SurveyMonkey charges. Are their services 5 times better? Here are the screenshots of the posts on Vovici’s Blog in case they are not available anymore. For more details about survey software services and online survey tools, read http://www.survey-reviews.net. 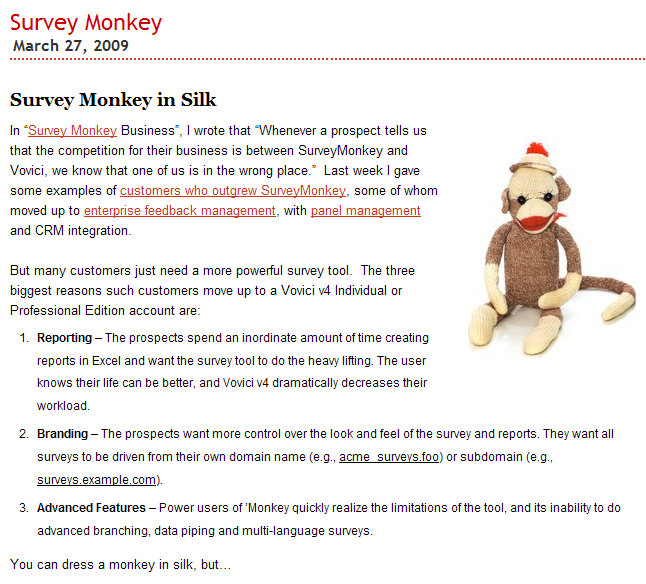 PS: We have no affiliations with SurveyMonkey or Vovici. You mention no affiliation w/SurveyMonkey or Vovici, what about w/QuestionPro or Zoomerang or any of the others out there for that matter? You do not give any info on who you are or why anyone should think you are an impartial reviewer. Where are you located? Are you an individual or a company? That info should be available for all to see. Send me an email if you would rather not reply to me here, I would like to believe you and your reviews so please do respond. @Terri We are located in UK. We are a group of marketing research professionals. We have no affiliations with Zoomerang or QuestionPro either. We try to be impartial. If you note anything incorrect on our site, by all means, please comment. Im working as a statistics consultant, mainly in biostatistics/medicin. When choosing a surveytool it is not always possible to choose a strict online survey tool. Since, not all clients want to put out there data on a third companies servers (and on top of that located in another countries with other laws regarding data handling). Depending on how sensitiv the data is; sometimes the client can accept that we storage the data on our own server and in most restrictive case the client wan’t to have the data on there own computer/s. For our purpose we would like a online survey tool. But, we would also like to choose to download the survey and run it on our own webserver or locally on some other computer. What are the choice then? Great inititive to start this website! This is a great site. This is needed because I am researching survey softwoare/SaaS options and these sites give little to no information about themselves. This type of software is needed to support quality management initiatives. Thanks for making this site. good job guys, very helpful reviews. I’ve seen no mention of Sawtooth’s SNAP survey software here, but not only does it operate across platforms (online, paper, PDA) but it also runs locally so you can store your sensitive data on your own hardware. And for the record I am simply a (former) user of this software with no formal attachments, financial or otherwise. We’ve used Snap in the past. We used the offline version. We have a small mr firm. It was a sizeable investement. With the license renewals and the add-on package cost, we eventually ditched it and moved online. We have used a number of online surveys: Form Tools, Survey Methods, and Question Pro. Question Pro has the most to offer with survey design options, i.e. logic and hiding questions, but I HATE their interface. It’s illogically designed. They have the worst customer service, while charging a $100 a month! The $100 is for one login. I WISH I could find another software with the same software features. We do not recommend Vovici. We were with Vovici until recently, but the program is so clunky. It takes hours to make small changes, survey output is so agley and nonpresetable to clients, management never takes it serious about our product development request. We’ve had down grading experiences every time they release new version. It seems that they cannot think outside of the Vovici’s box – workaround after workaround while core problems are never fixed. After a long struggle with Vovici, we switched to Qualtrics. Our programming time is 1/3 now, and available functionality is way above Vovici. A variety of question types, clean survey output, easy skip logic programming, you can make modification to survey even after launch, per seat price is way lower than Vovici, and amanzing customer service. The only thing I miss about Vovici is those smart and patient technical surpprt reps. But Qualtrics also has a quality support team. Above all, our staff seem happier in general after switching. I was wondering if you know of any survey tool or website that can provide more advanced report. Specifically, comparing means of some period vs. other periods of the same survey, for example, mean satisfaction of this week vs mean satisfaction of the last year. Are you familiar of any survey site/tool that can provide this? I’m Confirmit is in the second category, and having worked with it for years (as an end-user, not a programmer) I’m curious where it fits into the spectrum. Good article, gives one the food for a thought. 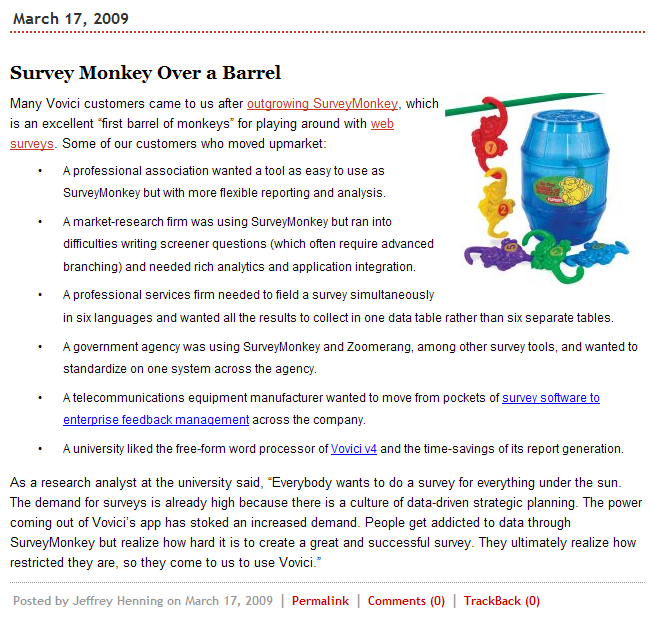 I have been using CreateSurvey from http://www.createsurvey,com and Surveygizmo at http://www.surveygizno.com, love the offline services of the former, the put my hard copies into my database. I’m not sure whether you were able to identify a vendor who could meet your temporal reporting needs, but know that Key Survey can handle this requirement. Please feel free to reach out to me for additional details. I work for the makers of KeySurvey. We have always had a free 30 day trial option which is very easy to start right from the website. (the link has been on almost every page since 2002). when we were lower end we had posted pricing, but at the enterprise level it’s often easier to have a conversation than work from a price list. We do love talking to our customer and trials, both from a support and sales point of view. We try not to let any calls go to voicemail. So if you have some high end needs, we would be happy to talk with you. I do a lot of web surveys and still do some paper surveys. If you want great products for these to areas at very reasonable prices look at the Gravic website – http://www.gravic.com . A lot of survey companies refer you to their Optical Mark Reader (OMR) software. Their Remark Web Survey is the absolute best and it will run on your server or be hosted on the Internet. And, their support team is at the top of the list. Gravic is very well known in the academic world. You might think I work for them, but I am just a very satisfied user. Have been for years – software that runs without hangups and is easy and logical to learn and use.